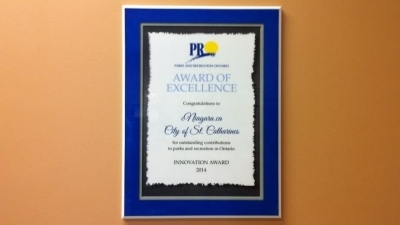 ​On March 26, 2014 cNiagara.ca was presented with an Innovation Award of Excellence from Parks and Recreation Ontario (PRO) at their 2014 PRO Awards ceremony. These provincial awards recognize the outstanding achievements of individuals and organizations that have enhanced the quality of life for Ontario's citizens. They showcase the very best of recreation and parks and serve to draw attention to the importance and benefits of recreation for healthy people, vibrant communities and sustainable environments. cNiagara.ca received this award as it demonstrates exceptional innovation in design, presentation and implementation in the parks and recreation field in Ontario. On hand to receive the award were representatives from the City of St. Catharines including Deputy Mayor Dawn Dodge and staff from the Recreation and Community Services department as well as the co-founders of Form and Affect, Brent Porter and Paul Vance. And of course, the project could not have happened without our many community partners and funders, including the Government of Canada, the Niagara Region, Carousel Players and the Centre for the Arts, Brock University. Thank you to the City of St. Catharines for the nomination, we are very honoured to receive this award!